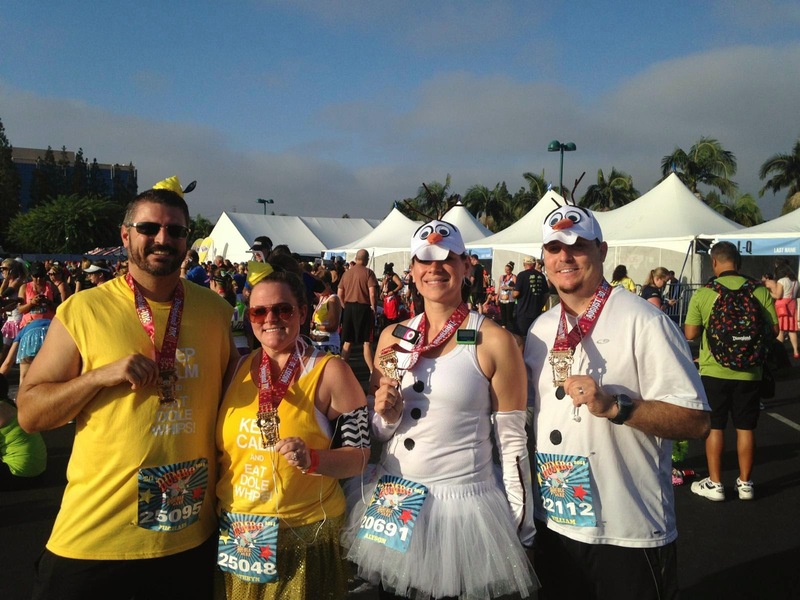 On Saturday, August 30, 2014, the second Disneyland 10k was off and running! This was the first part of the Dumbo Double Dare. Since this was the first time I was out for any distance since surgery, we planed to keep this one slow. We left our hotel a little before 4 am and took the ART bus to the Disneyland area. Our family met us at the bus stop; they were staying right across the street. The weather was much better than last year and we were quite optimistic about the morning. My mom was cheering, so we said goodbye early and she gave me these words of wisdom-- "I hope you make it". LOL... thanks mom! I just couldn't let her live that down. The four of us headed for the starting corrals. 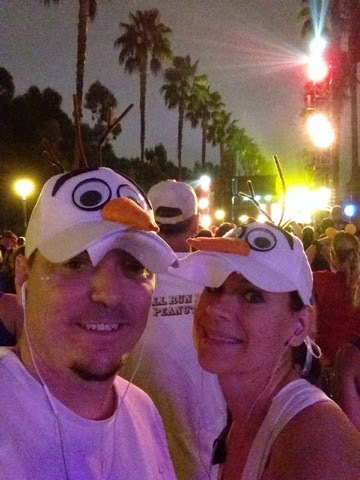 My hubby and I were planning to "run" together (actually walk and save our legs for the half marathon), so we lined up together at the back of corral B. runDisney went all out on the Elvis/Stitch theme right from the start. It was fun, but not really my thing. Confession time: I only first saw Lilo & Stitch a few months ago. We were off about 8-10 minutes after corral A, and we started out walking. 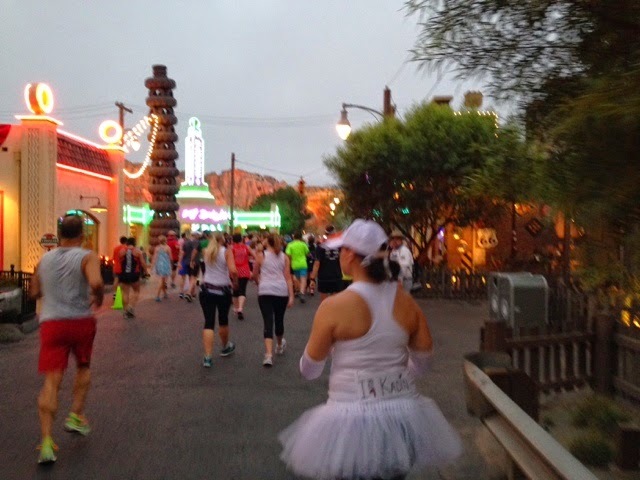 The first mile + are outside the parks. I give it to the spectators, they were kind trying to cheer us on (we were really straggling), and I seriously lost it. Crying, whining, ready to go back to the hotel and just give up. It was humbling to be walking while everyone flies by. My hubby really had to talk me off a ledge just to get me to keep moving forward. Somewhere between mile 1 & 2 (I think)...or maybe right after mile 2...hmmmm, maybe I should have stopped pouting and payed more attention. Anyway, somewhere around there we entered California Adventure. Once we were in the parks, my mood definitely improved. We were walking at a good pace--somewhere around a 15:30 min/mile. Since we started in corral B, we knew we had plenty of time to finish, so my worries were gone. DCA has tons to look at, and we arrived just around dawn, letting the glow of Cars Land capture our attention. 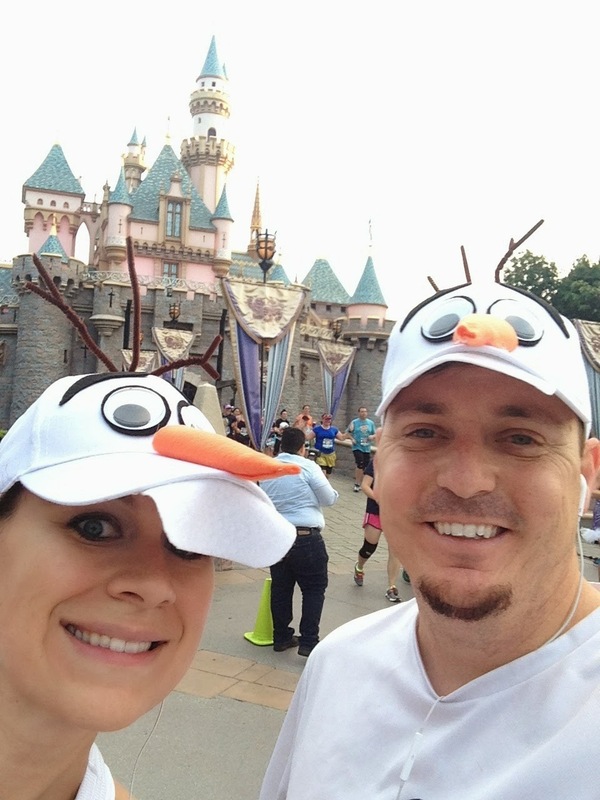 There is something so different about running through the parks. There's just a little more magic than when its crowded with people everywhere. DCA pulls out all the stops, running World of Color, running rides, and giving runners plenty to look at. The course was also themed out with plenty of Elvis. Might have been pretty novel for some, but for this Vegas girl, an Elvis sighting is almost a daily occurrence. 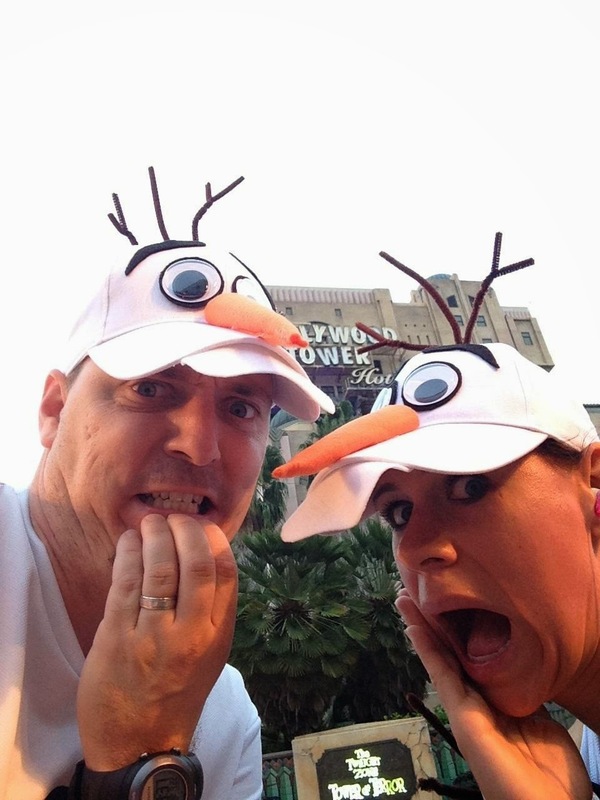 After a run through Cars Land, through Tower of Terror, around Paradise Pier, and out through the front of the park, we were off to Disneyland. The crowd really perked up and gave us a good push into the next park. Right around the corner and we were on to one of the highlights: running down Main Street USA! 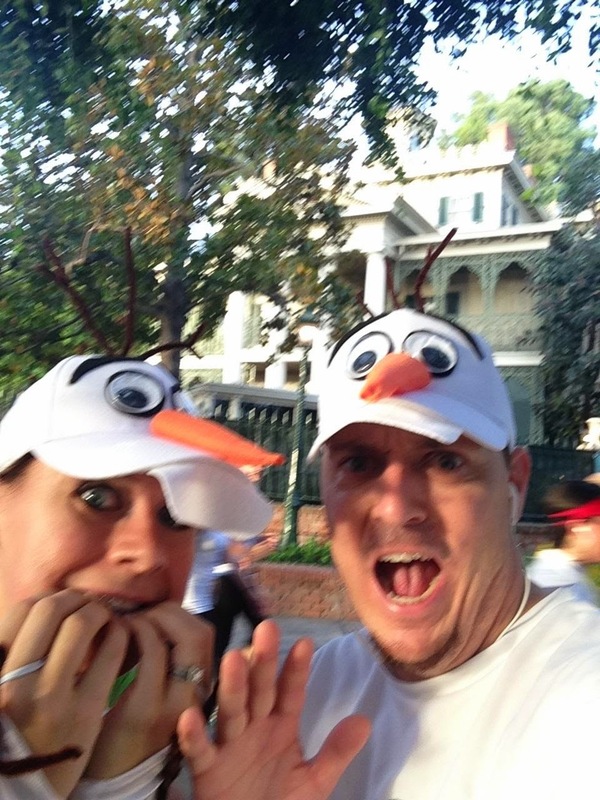 For those who have never done it, I promise you, it's one of the most magical moments of ANY Disney race. No matter how many times you do it, it's still super special. Through Tomorrowland, then Fantasyland, then through the castle--another huge highlight! Over and over again, no matter how many times, it's always magical! Then through the rest of the park, and it definitely makes the miles fly by. You also get a few steps "behind the scenes" which is always fun. Okay, not always--the trash area and animals can get pretty smelly, but it's still pretty impressive, especially when you think about how many thousands of people never get this perspective. You are around mile 5 when you finally exit the parks, but then you just swing into Downtown Disney. 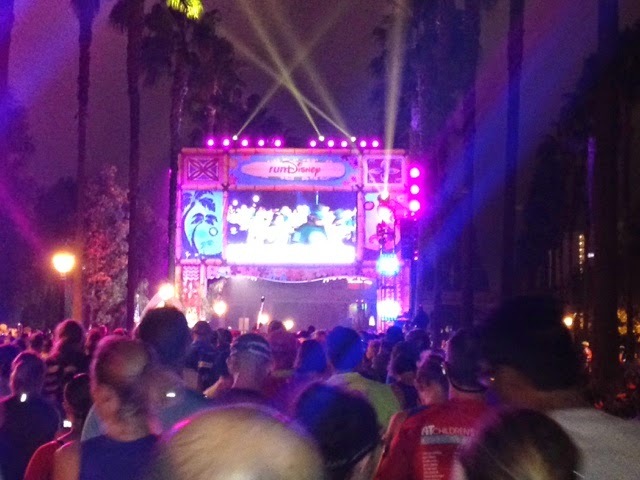 The crowds are raring to go and cheer, and you are still surrounded by Disney! 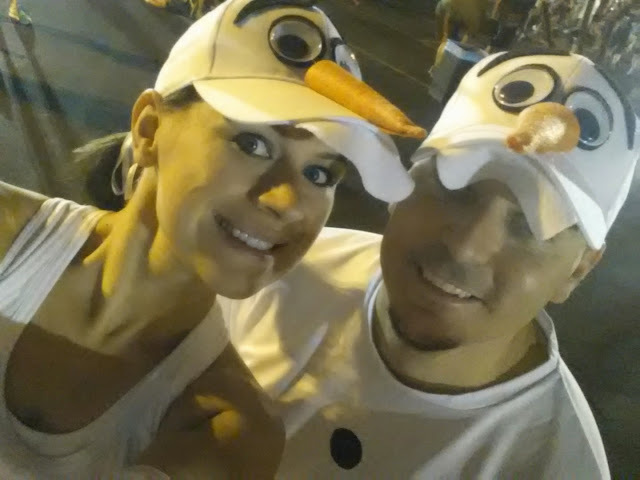 Seriously, if you are looking to run at Disney and want a race full of magic, the 10k is the way to go! These two Dole Whips were a hit! A few twists and turns and you're at the finish line. Oh, the sweet, sweet finish line! I immediately collected my bling and headed straight for the ice! I wasn't going to jeopardize my half the next day by being stupid. I even opted for 2 bags :) We got our snack box, our water and PowerAde, and were off to meet up with the rest of the family. My mom was already waiting and Chris & Katie weren't far behind. We took a bunch of pictures (the Dole Whips were a HUGE hit), and we were headed for the showers! Overall, the race was a little warm and humid, but not nearly as bad as last year. I really do love this course, and I know we will all be back again next year to conquer the 10k...and the Dumbo Double Dare! 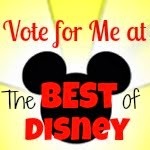 Yep...Disney DOES Run in the Family! 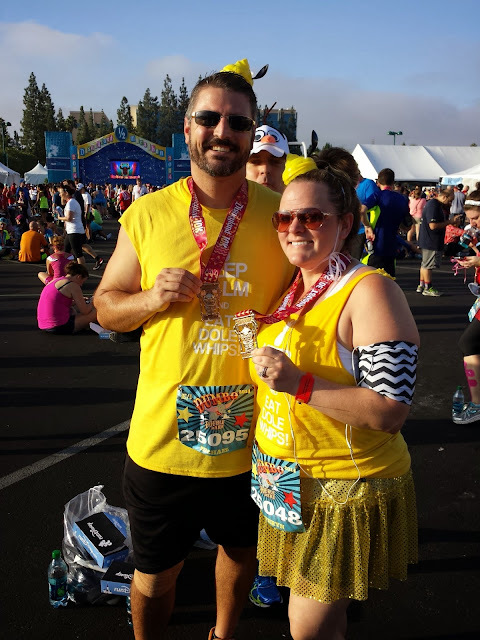 Great recap, and believe me, I've had my share of meltdowns at Disney races (and, um, regular races, haha) for all kinds of reasons...but when you're in those parks, suddenly, nothing else seems to matter! :) I LOOOOOVE your costume, and you guys look adorable! Thanks Jennifer! 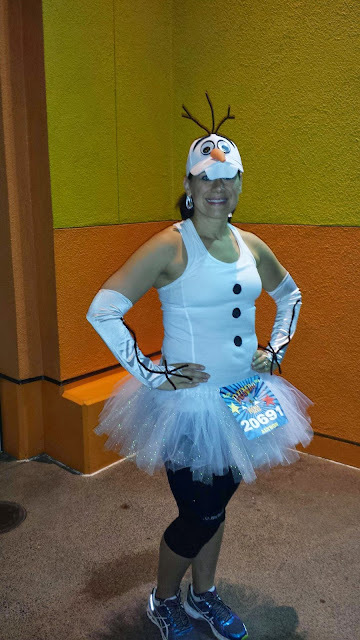 My Olaf costume may make a second appearance in February in Disney World...shhhhh... :) Thank goodness for the parks, otherwise that may have been a miserable 6.2 miles. 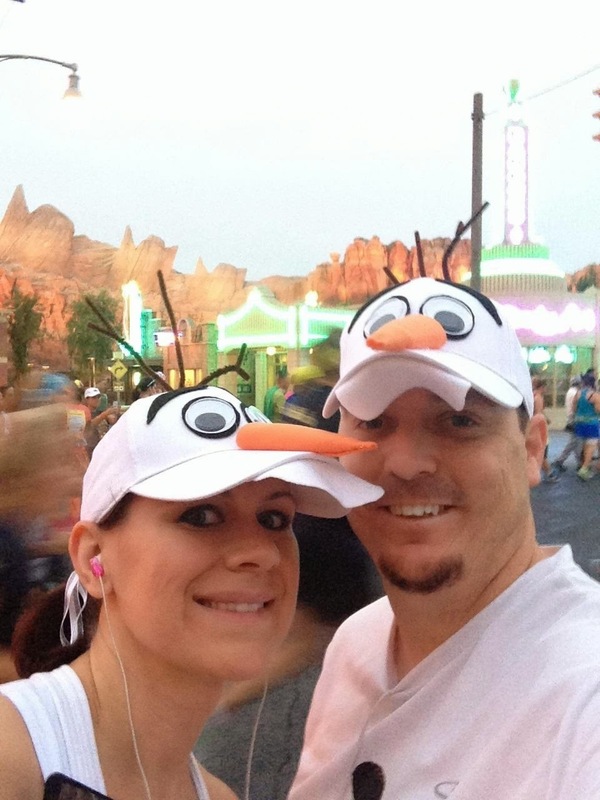 Just one of the reasons I love to run at Disney!!! !